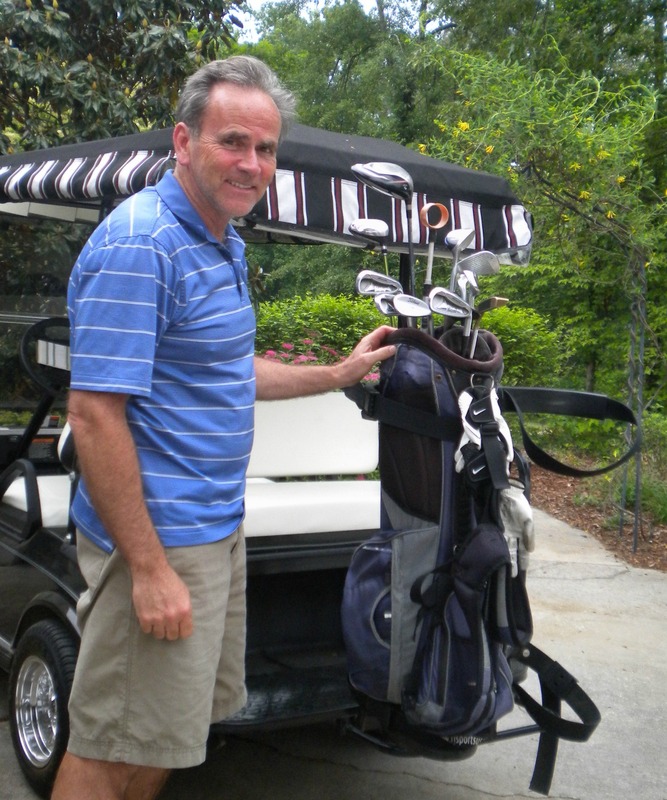 The golf bag rack is the most important golf cart accessory for a golfer with an electric golf cart. With several to choose from, determining which rack is best for your golf cart depends on a couple of things. The first consideration is whether your golf cart is a two seat or a 4 seat golf cart. The rack on a two passenger golf cart is a more permanent golf cart accessory. It cannot be easily removed and replaced as you can see from this picture below. For those with a 4 seat golf cart or with a rear seat there are more options. One is to have a rack that faces away from the back seat passengers and the other is a rack where the golf cart bags faces towards the passenger seat. All of the racks hold two bags. 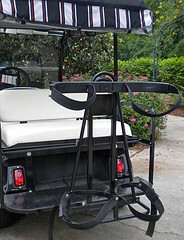 The Golf Cart Rear Seat Safety Grab Bar is sold separately from the golf bag rack. My rack can be removed from the safety bar when not in use as it can be easily lifted off the safety handle. However it's not a problem just to keep it on the golf cart. 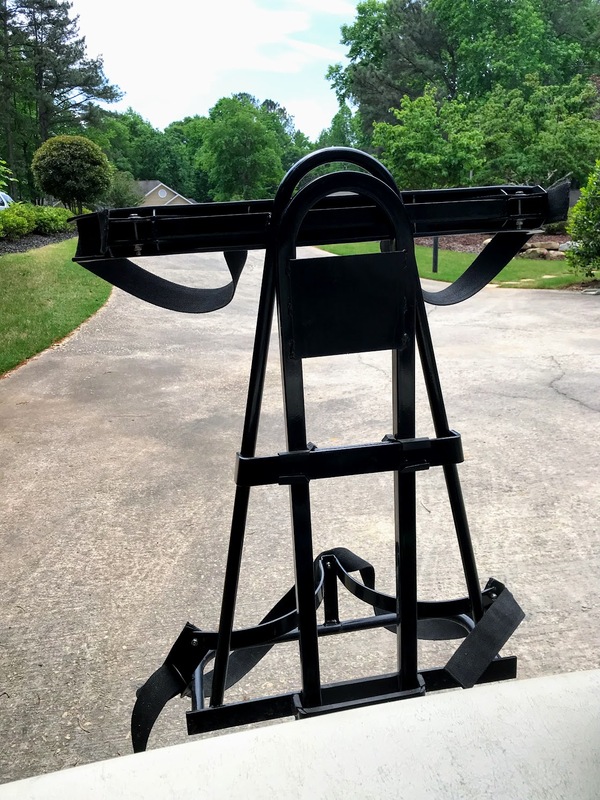 My rack is made of steel and has a black finish. You can also get ones with an aluminum finish. The straps are adjustable and hold two sets of clubs without ever getting loose. This golf cart accessory is universal meaning it doesn't matter if it is an EZ Go, Club or Yamaha golf cart. What matters is if it is a two seater, four seater and if the back seat is a flip flop seat. My golf bag rack gets lots of use, so the straps are starting to fray - the straps can easily be replaced when the time comes. 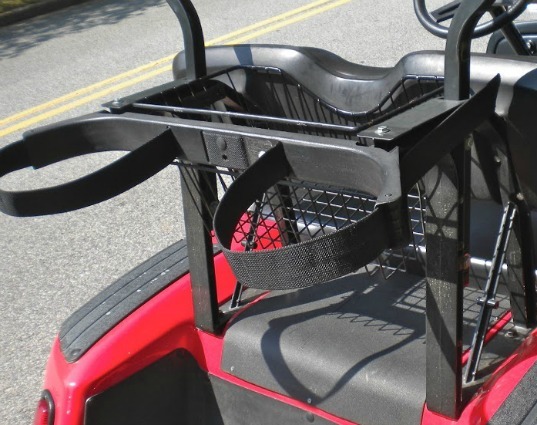 Another option for a golf bag attachment on a 4 seat golf cart, is to place them on the sides of a golf cart flip seat making it possible to still have 4 passengers on the cart. This design doesn't allow for a safety grab bar in the middle. This deluxe golf bag rack includes the grab bar, sand and seed bottle, a ball and club washer and a 12 pack Igloo cooler. The convenience and great combination of golf accessories will speak to any serious golfer. 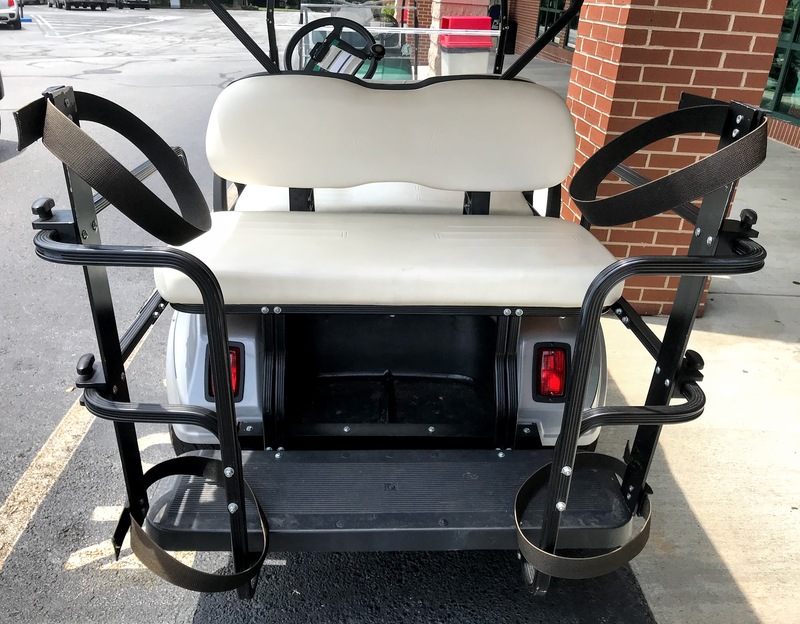 Made of durable powder coated steel the install does require some drilling and is made specifically for golf carts with a rear seat. 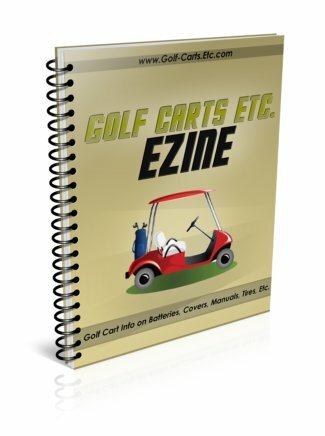 The universal design means that those who own a Club Car, EZ-Go or Yamaha can utilize this golf cart accessory. The straps on my golf bag holder get lots of use and after years of constant tightening and loosening and exposure to rain, sun and wind, they have become frayed and need to be replaced. 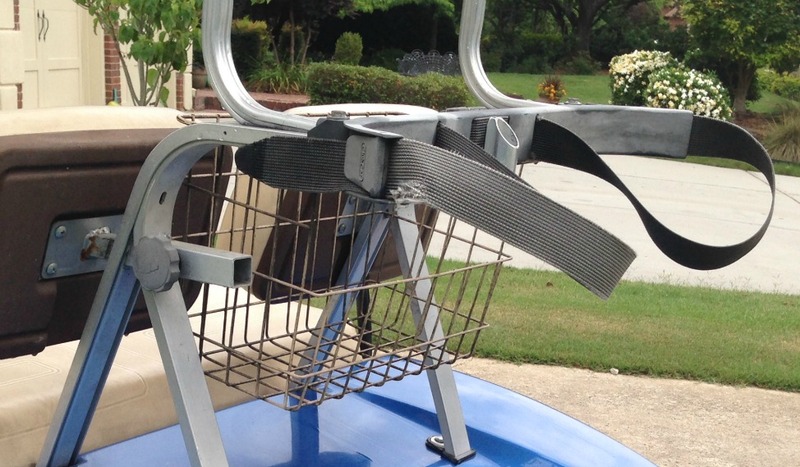 So get your game going with this golf cart accessory so you won't need to rent a cart the next time you play. 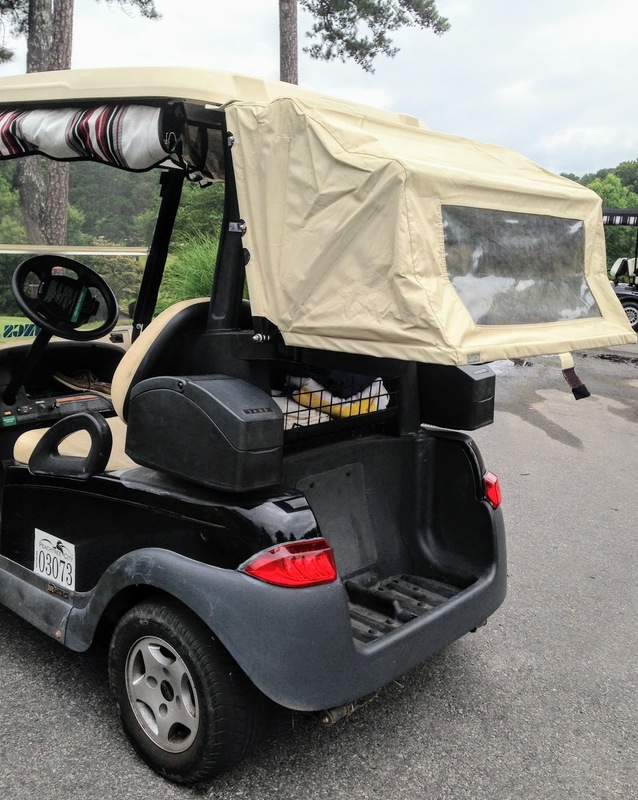 A golf cart club canopy protects your clubs in all kinds of weather without having to struggle to access them. 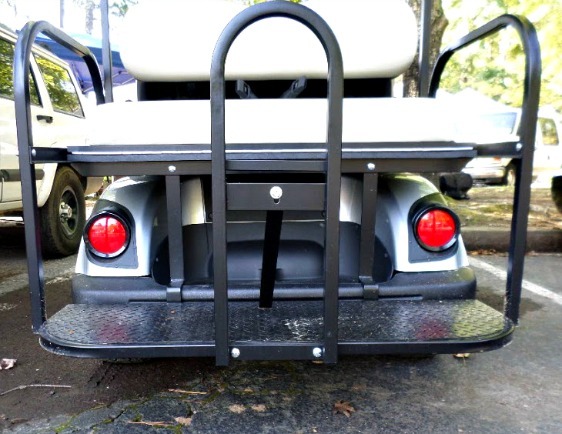 This easy to access canopy can be used on most Club, Yamaha and EZ Go golf Carts. Made of durable, fade, stain and mold resistant Sunbrella fabric the DoorWorks dry club cover keeps your clubs dry in the rain and easily folds up in good weather. It works with or without an enclosure.